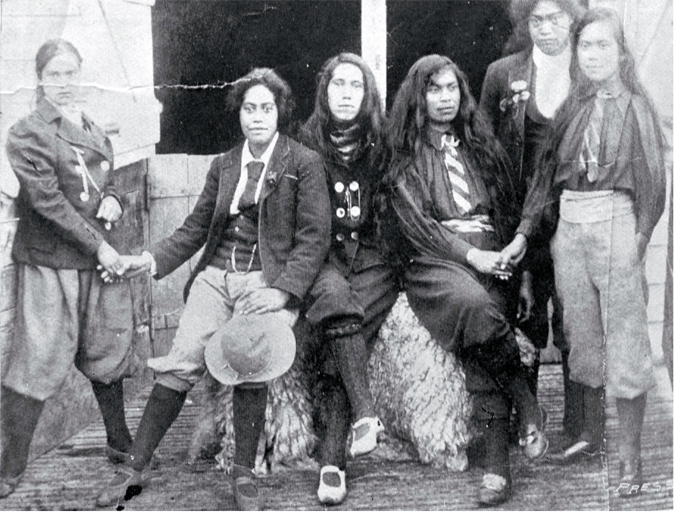 Seven years before Emily Davison stepped out in front of the King's horse at Epsom for the cause of women's suffrage, this photograph of a group of Maori dress reformers was taken in in Waipawa, New Zealand. By 1906 women in New Zealand - and that meant Maori women too - had already had the vote for thirteen years. How confidently these six young women stand and sit or lean, with legs astride or casually crossed. How unabashed they are about meeting the camera's gaze. At first glance, I thought they might be about to mount horses and go off riding, and I took the sheepskin for a straw bale. But their shoes don't look quite sturdy enough for stirrups. If that is a stable, it looks empty. These women are clearly wearing these splendid knickerbockers simply because the garments are comfortable and practical and rational. What should we think about their bold, striped ties? The watch chains? Their long, loose hair? Those clasped hands? I came across the picture while trying to find out about clothing in the nineteenth-century Pacific, and was immediately intrigued. All I can tell you is that it was first published in the Weekly Press, a weekly edition of a Christchurch newspaper called The Press which had pages of photographs from around New Zealand and also overseas. It's simply titled (by the library, I believe) 'A group of Maori women dress reformers', and was taken by a man called William Golder in Waipawa. My immediate instinct was to follow that lead, and I quickly enough identified him as a Scottish settler-poet with an interest in photography. A tempting lead, given my own interest in nineteenth-century photography, generated by working on the Paris Commune. And then I stopped myself. What was I doing - pursuing the man who had taken this picture - when my focus (and yours) should be on its anonymous, independent subjects? Many thanks to Christchurch City Libraries - Ngā Kete Wānanga-o-Ōtautahi - for permission to use this photograph. You can find out more about New Zealand's dress reform movement and see a picture of the famous 'knickerbocker wedding' here. I'd say they were feminists...having appropriated the symbols of male dominated European culture in the accessories. As for holding hands...sisterhood! Relationships are a political statement too. What a fabulous photograph! Stories to be told here, for sure! What an amazing discovery, Lydia. I see a fine novel emerging. I wish I knew enough about New Zealand, both past and present to filch it. Only joking, of course.